PRODUCTION EXPO 2014: Yoad Nevo is something of a renaissance man in the world of mixing and mastering. Having worked with acts like Pet Shop Boys, Goldfrapp, Moby and The Sugarbabes, Nevo operates out of his cutting-edge London studio complex, Nevo Sound (which also houses his breath-taking collection of analogue and digital synths). 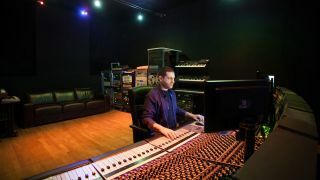 In-demand for his production savvy and his technical know-how, Yoad Nevo has been involved in the design and development of numerous plug-ins in the Waves range. Given that he is also one of the most respected mastering-engineers in the country, MusicRadar sought some wisdom on the noble art of mastering from the man himself. Why is mastering such a key part in the recording process? "I think that creative people throughout history were always using whatever they could in terms of technology. The same still applies to producers"
"Obviously the traditional role of mastering in making records was and still is to even out the differences between the tracks that are due to different recording method, different studios, different producers and things like that. In the past twenty years or so there's also been a lot going on in the way of bringing up the level and making it as loud as possible - sometimes louder than possible! "One of the main contributors to this phenomena is Waves, actually. When we did the L1 Ultramaximiser and later the L2, I would say that they made the whole thing more accessible. I think that mastering currently takes another role which is almost part of the production. "So, you can do a lot to the sound of a record by taking some of the mastering techniques to the extreme allowing almost a stylistic statement to take place. This has gradually entered the production process in the past 10 to 15 years." Is there more overlap between the mixing, producing, mastering disciplines these days? "In a way, because a lot of people write the tracks into the sounds and the beats. They have the beats as the first part of the writing process then they just put some mastering plug-ins on everything, which squashes everything and makes it pumping. "Two decades ago that would've been considered taboo, almost but now a lot of people are doing just that. Even if they end up re-producing the tracks, mixing them or getting them properly produced some of these elements stay because they're now part of the production. "A lot of mix engineers apply mastering plug-ins to the mixes they send to be mastered and that also dictates some of the things you can and can't do during the mastering process." How has your role changed in the shifting landscape of the music industry? "For me, as a producer but also as someone who is very much involved in technology through plug-in and digital processor designing, those things go hand-in-hand so it hasn't all come as too much of a surprise to me. "I think that creative people throughout history, whether in music or in other arts, were always using whatever they could in terms of technology. The same still applies to producers, mixers and mastering-engineers nowadays. "I think it's very exciting that people use audio processors not necessarily in the way they were intended to be used by the people who designed them. That's the same, really as back in The Beatles day when they experimented in the studio, only today the technology is different and the possibilities are endless." Has it been important for you to be involved from the outset in the design and creation of plug-ins? "Yeah, I've been doing it for 17 years or so since I joined Waves and, as an engineer and as a producer I've always been very technically minded. This, to me, feels like a natural evolution of my role as a studio engineer to get deeper into the technology. I was very lucky being able to start doing that in 1996 when I joined Waves. I learnt a lot whilst being involved in so many innovative and pioneering products." "I don't have any secrets, I do what I do. If anyone else can learn from it or even copy it then that's fine"
Have we now reached the stage where the software matches the sound and performance of the hardware it emulates? "Sonically, that's obviously the goal and I think a lot of companies are getting really close. However, there's still something to be said for turning knobs and connecting with gear in a way that's different to how you connect with a mouse. As a guitarist I can relate to that and also through my hardware synth collection - there's really nothing like turning knobs on a Mini-Moog. "The only thing I would say, for me, being spoiled with so many guitars and synthesizers in my collection I do kind of miss the days when I only had one guitar and one compressor!" What would you consider the essential tools of your trade? "My ears. I don't think that much else really matters. I'd maybe extend that to my ears and the listening environment and speakers. Being able to monitor what you're doing properly is probably the most important, if not the only, parameter that really matters. That said my most used bit of gear in the mastering process is my Neve V51 compressor." "I think, when I first started I would have been very happy to have all that knowledge available to me. I was assisting in a studio and working with an engineer who didn't let me watch him setting up the Lexicon 224 because it was 'his secret'. I always thought that was a bit odd. I don't have any secrets, I do what I do. If anyone else can learn from it or even copy it then that's fine as it will always sound different." What's the idea behind the 'Nevo Mastering' service you set up? "Basically it's a mastering service that allows people to send their mixes to be mastered by me for a price that isn't very high. Since it's unattended sessions and most of the artists are unsigned artists it's also a great way of hearing and getting involved with new music from all over the world. When I master something I get involved with it emotionally in a way which is different to simply listening to music." "You have to take each one on its own merits. I don't have any ego problems because I know when I get involved in a project I know it will sound like it was done by me, whether that's mixing, production or even mastering. So, I'm not too concerned about the level of involvement; it could be just mixing or mixing and mastering. I'm just happy to get involved with any level of production as I love it, that's what I do." Do you have any advice for any aspiring mastering-engineers out there? "Nothing I can particularly think of other than to remember that sometimes there are no shortcuts. Sometimes you have to just go through certain things and it takes time. When I started out a really good engineer told me 'you don't really know what a mix is until you've done 200 mixes'. Many thousand mixes later I can definitely say that there's something in that."